The “DaMaGe-Initiated-Reaction” (DMGIR) computational model has been developed to predict the response of ideal high explosives to impulsive loading from nonshock mechanical insults. The distinguishing feature of this model is the introduction of a damage variable, which relates the evolution of damage to the initiation of a reaction in the explosive, and its growth to detonation. 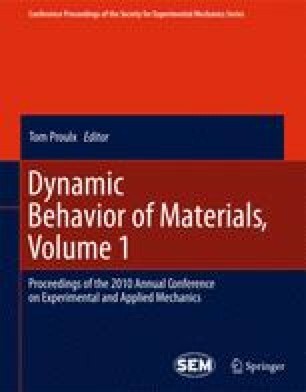 This model development effort treats the nonshock initiation behavior of explosives by families; rigid plastic bonded, cast, and moldable plastic explosives. Specifically designed experiments were used to study the initiation process of each explosive family with embedded shock sensors and optical diagnostics. The experimental portion of this model development began with a study of PBXN-5 to develop DMGIR model coefficients for the rigid plastic bonded family, followed by studies of the cast, and bulk-moldable explosive families, including the thermal effects on initiation for the cast explosive family. The experimental results show an initiation mechanism that is related to impulsive energy input and material damage, with well defined initiation thresholds for each explosive family. These initiation details will be used to extend the predictive capability of the DMGIR model from the rigid family into the cast and bulk-moldable families.